AMERICANEAST is a 2008 American drama film about Arab-Americans living in Los Angeles after the September 11 attacks. The story examines long-held misunderstandings about Arabic and Islamic culture, and puts a human face on a segment of the American population about whom most Americans know nothing, but who today are of particular interest to them, either from curiosity or suspicion. The story highlights the pressures under which many Arab-Americans now live by focusing on the points-of-view of three main characters. 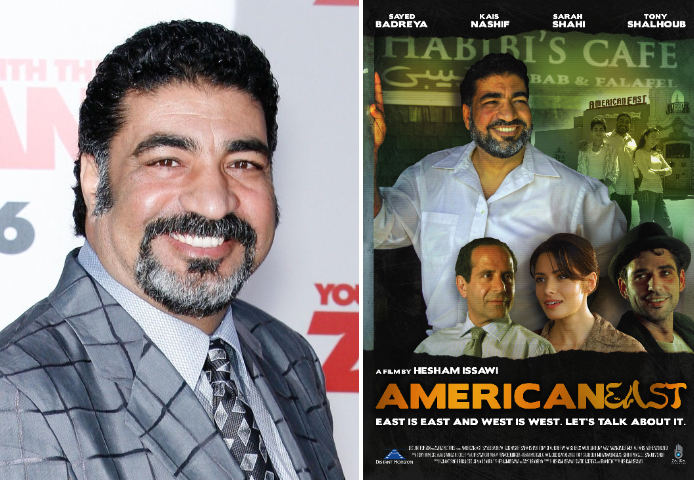 Mustafa (Sayed Badreya) is a widowed Egyptian immigrant and the owner of Habibe’s Café, a popular hangout in Los Angeles for those with Middle Eastern backgrounds. He is devoted to providing his son, Richard Chagoury, with a moral upbringing despite the pressures of contemporary American urban life. He also finds himself cast in the role of protector to his unwed sister Salwah (Sarah Shahi), for whom, by family and tribal custom, he is responsible for finding a traditional suitor. But his respect for tradition comes up against his own aspirations to adapt to the American Dream when he decides to open a new restaurant with a Jewish partner — his friend Sam (Tony Shalhoub). This unholy alliance is unpopular amongst the habitués of his café and the insular Arab community in which Mustafa resides. It is one of several personal points of tension that gradually build against the backdrop of larger, national events affecting the Arab-American community and lead to the explosive denouement of the story. Salwah, Mustaf’s sister, must also reconcile her traditional values and familial obligations with new American realities. Although she is grateful to Mustafa for bringing her to America when she was young, and allowing her to pursue an education, conflict arises between them when Mustafa insists upon fulfilling his duty of finding her a traditional, arranged-marriage partner from Egypt. The arrival of this arranged suitor, her older cousin Saber (Al Faris), throws her life into turmoil and makes her question her own beliefs and faith. Secretly, she is attracted to an American, Dr. John Westerman (Tim Guinee), a young and attractive non-Muslim. Any caution she feels toward him, however, is thrown to the wind by the abrupt arrival of Saber and a possible impending marriage that she does not want. She becomes sorely tempted to experience intimacy with the young doctor outside of marriage, a taboo. While she undergoes this internal conflict, her suitor Saber is staying as a guest at the home she shares with Mustafa and his children, and the incompatibility between this traditional man, her future husband, and Mustafa’s Americanized family is another source of irritation adding to the mounting tensions underlying the story. Mustafa’s friend Omar (Kais Nashef) is a struggling actor and Habibe’s Café regular, a young Egyptian man who supports his dream of becoming a film star by working as a part-time cab driver for Mustafa’s ragged, one-car taxi company. Because of his Middle Eastern looks and accent, however, he is constantly cast in the role of a terrorist in American TV shows that portray only a shallow understanding of Arabs and their culture. When an opportunity for a non-racially-designated role arrives, Omar feels his chance for success — to be seen as an actor first and not a Muslim — has finally arrived. It is the break he has been waiting for on many levels: a chance at the financial freedom necessary to marry and support his pregnant American girlfriend Kate (Amanda Detmer), and a chance for him, and his future child, to be embraced as an American, in the same way that he has embraced America. But misunderstandings and prejudices related to his Arabic background conspire against him once again and his opportunity is lost, pushing Omar to make a drastic, unreasoned decision that sets off a chain of events leading to a violent conclusion that affects the lives and conflicts of all the other characters — an explosive reminder of the simmering pressures under which Muslims live in the United States today. Will their American Dreams be shattered by a climate of distrust and suspicion, or will their hopes and aspirations be embraced by their fellow Americans? AMERICANEAST is available via Vimeo. We’ll be back tomorrow with more #EssentialMuslimFilms! Writer. Director of Community at @theblcklst. Spooky.